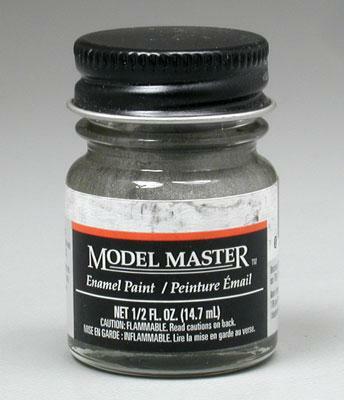 This is a 1/2 oz (14.7mL) glass jar of Enamel Steel Paint from Testors. Retail $4.11 SAVE 30% ! This is nice to simulate steel on your models. Its coverage is nice and not blotchy like acrylics. This is not a standard silver color. You will see a difference!! One 1/2 oz (14.7mL) jar of Enamel Steel Paint. I have been using this instead of silver when silver is called for in building model warships. The steel also does not shine as much and looks better then using silver on searchlights, some ship masts, and even on the main guns on ships and other ship&apos;s equipment. "Model Master Steel is a great alternative to plain silver." I have been doing scale models for years and I am sold on Model Master. I do mainly military aircraft models and the attention to detail in historical color matching that Model Master has is beyond compare. "Good steel finish but a bit inconsistent." This steel blend provides pretty easy coverage, but must be mixed extremely well to prevent inconsistent finish on the project, it works great for undercarriage components like the exhaust or for engine blocks, but as I mentioned the finish can be a bit inconsistent in final color, particularly if you do not mix it vigorously prior to application. Compared to other metal finishes this one is a bit more difficult to apply without having varying color in the finish, but I believe that it is intentional to make the final product appear slightly worn. Overall it&apos;s a good simulation of steel but you have to mix it thoroughly to get a fairly even finish over the whole project.